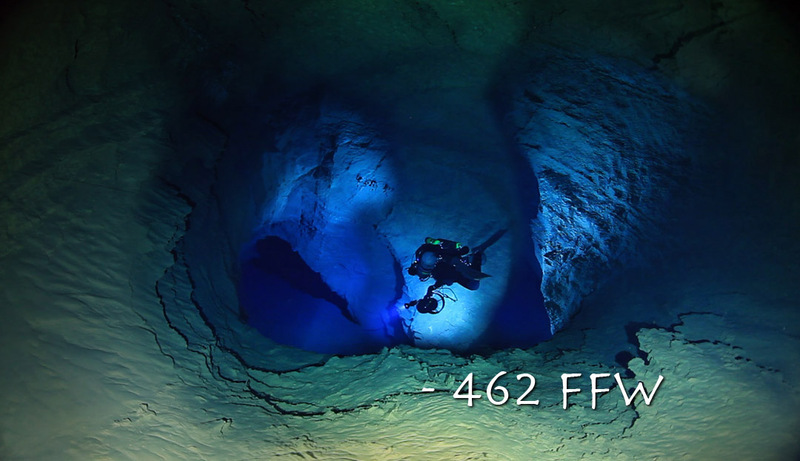 An early January expedition to explore Phantom Springs Cave in Texas saw divers hit a depth of 140.8 meters (462 feet), making it the deepest underwater cave system known in the United States. 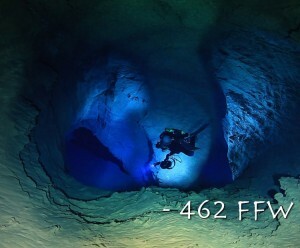 Following the success of the 2012 expedition, which unexpectedly extended the maximum depth of Phantom Springs Cave from 24 meters (79 feet) to 72 meters (237 feet), a hand-picked group of the United States’ best underwater cave explorers assembled in the Texas desert from January 5-11, 2013 with a goal to push it even further and deeper. 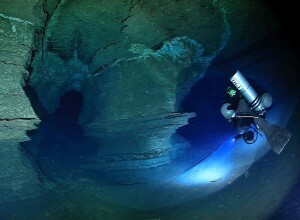 The team, composed of members who specialize cave survey, underwater high-definition videography and photography, and cave biology and science, was organized into groups, each with specific tasks. The survey team, whose goal was to improve and update the old Grade 3 survey, spent a total of 37.7 man-hours of diving and managed re-survey and sketch a total of 1758 meters (5,769 feet) to Grade 4 survey. They also were successful in adding some 329 meters (1,080 feet) of dry survey. Other teams kept busy setting up sediment traps, collecting water quality data, and shooting hours of high definition video and still photos both above ground and underwater. Meanwhile, the exploration team continued from where they left off in 2012, when the cave passage rapidly dropped to the new depth of 72 meters (237 feet). Following the steeply sloping passage, the team quickly dropped to a depth of 98 meters (320 feet) before entering horizontal tunnel at a depth of 104 meters (340 feet). After only about 61 meters (200 feet), the tunnel opened at the top of a large, deep, rectangular fracture which ran perpendicular to the passage. Although it was hard to make out the floor, it was estimated that the bottom of the fracture would be over 122 meters (400 feet) deep. A subsequent dive on January 8th revisited of the fracture and found an outgoing passage at the bottom, at a record depth of 140.8 meters (462 feet), which continued horizontally as far as their lights could penetrate. Unfortunately, encountering these extreme depths meant that continued exploration would go beyond their planned safety measures and reluctantly the divers had to return to the surface. 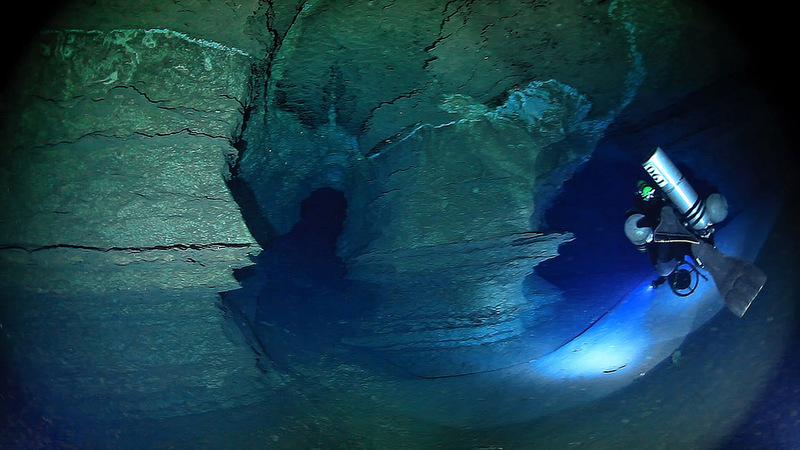 With the maximum depth at the bottom of the fracture reaching 140.8 meters (462 feet), Phantom Springs Cave has surpasses Florida’s Weeki Wachee Springs as the deepest naturally formed underwater cave in the USA. Plans are already in the works for a return expedition to push the cave further, however due to the extreme depth and distance, future exploration will require bailout rebreathers and a potentially a decompression habitat placed over 6,000 feet into the cave. Furthermore, as Phantom Springs Cave is home to the endangered Comanche Springs Pupfish and Pecos Gambusia, access to the cave is extremely restricted and only two permits are ever concurrently issued, both of which are currently assigned until at least 2015. For the complete Phantom Springs Cave 2013 expedition report, visit the ADM Exploration Team website. Recreational Cave Diving Coming to Florida’s Wakulla Springs? Major props go out to Brett Hemphill, Curt Bowen, Andy Pitkin, and all the rest of the crew from ADM for this amazing discovery!